john@johnsnellphoto.com Now available. Scroll down for order form. 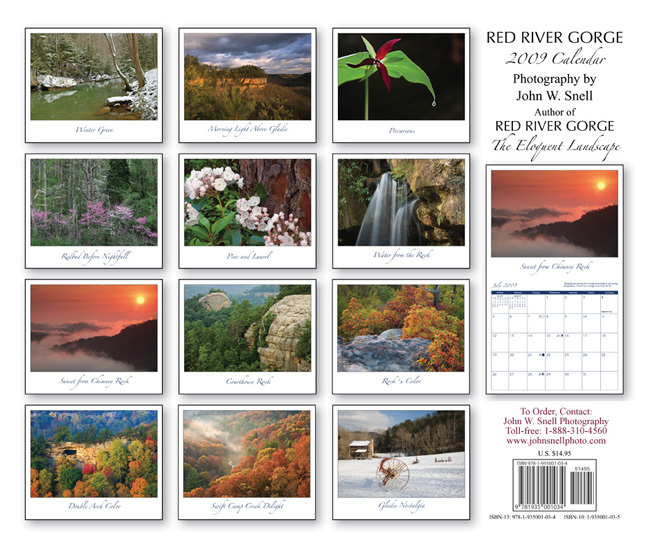 After the 2008 Red River Gorge calendar sold out in only 7 weeks last year, we were determined to 1) print more this time and 2) get them out to the public more quickly. 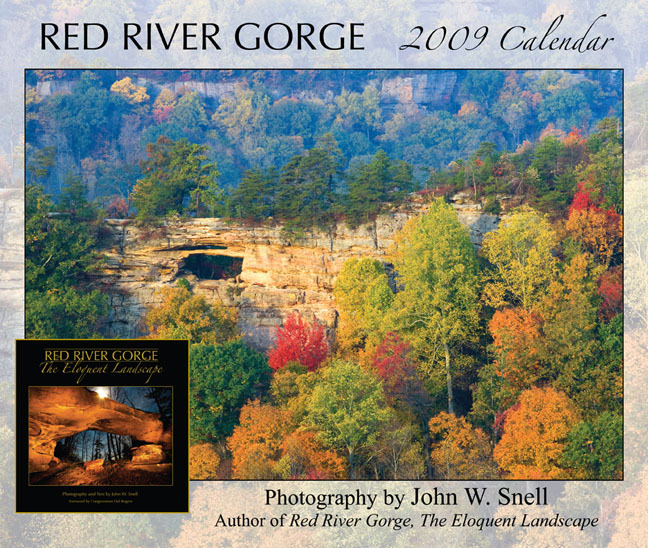 This 2009 calendar contains 12 new images that once again depict the awesome beauty of eastern Kentucky’s Red River Gorge area (near Natural Bridge in the Daniel Boone National Forest). The large calendar opens to 13" x 22" (vertical). Twelve photographs from "the gorge" showcase one of Kentucky’s most treasured areas, known for its 100-plus natural stone arches, extravagant displays of springtime wildflowers, stunning autumn color and varied recreational opportunities such as world class rock climbing, hiking, canoeing, camping and more. Quantities are limited, so get yours now! Lastly, the calendars are also available at Lexington, Kentucky retailers such as Joseph-Beth Booksellers(859-273-2911), Barnes & Noble (859-543-8518) and Good Foods Market & Cafe (859-278-1813). Also carrying the calendars are Court Street Gifts in Winchester, Ky (859-744-3434), Promenade Gallery in Berea, Ky (859-986-1609), The Kentucky Artisan Center at Berea, Ky (859-985-5448), Porter's Chevron at Exit 33 of the Mountain Parkway (606-663-4766), Red River Outfitters at Mtn Parkway exit 33 (606-663-8858) and the gift shop at Natural Bridge State Resort Park (606-663-2214). Bookstores in the Louisville, Kentucky and Cincinnati, Ohio area also stock the calendar. Call ahead for availability. All images and text Copyright John W. Snell, 1999-2008. This page last updated on September 6, 2008.